Not too long ago, my friend AJ published a data-rich article about why online food ordering is a major opportunity for restaurants. It improves accuracy of takeout orders, extends your restaurant brand, and taps into a supplementary revenue stream that diners are demanding. New Toast data also suggests that online orders generate more revenue than in-store business. As you probably know, Toast offers an online ordering module that’s built in to our restaurant POS systems (which means no 30% commissions from third-parties and orders sent directly to the kitchen!). So naturally, we spend a lot of time thinking about how online ordering impacts the foodservice industry and how we can improve upon it. The data gurus at Toast recently conducted an analysis of our top ten highest-volume users of online ordering. The purpose of the analysis was to find out the effect that an online ordering option had on their business. The Key Takeaway: The average online ordering check size is 23% larger than in-store checks. In other words, customers at these restaurants are buying 23% more when they order their meal online. Something about the online experience is causing them to go for those chips or upgrade to the premium beef patty. I talked to a few places using the online ordering system offered by Toast to try to understand why online orders are generating higher ticket sizes overall. I heard specifically about the power of visuals and consistent strategic upselling. First, I spoke with Danny Ganam, chef and co-founder of Zuuk Mediterranean Grill in Miami, FL. As a fast casual lunch spot, the Zuuk experience is all about being able to see your selections you put it on your pita. 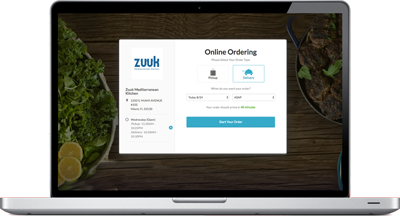 Zuuk is able to provide a similar experience online by including photos of the food on the website menu. Danny’s claim is actually backed by science. One study found that salad consumption in kids increased as much as a 90% when they were shown a picture of a salad at mealtime. Customers have responded heartily to the online fast casual experience in Miami. Online orders at Zuuk make up about 30% of overall sales! It’s no secret that upselling in a restaurant environment works. McDonald’s notoriously effective upsell “Would you like to supersize that?” made headlines in the early 2000s and was blamed (perhaps hyperbolically) for contributing to the nation’s obesity epidemic. Online ordering offers a consistent purchase experience, the same for every guest, so upsell tactics like prompting for dessert or suggesting a side of breadsticks reaches every customer, every time. Matt Stanfield, owner of Mattenga’s Pizzeria in Schertz, TX, views his online ordering platform as an essential revenue stream. Online checks at Mattenga’s Pizzeria average 38% higher than in-store checks. He attributes this to his website’s inherent ability to immediately upsell customers before they make a purchase decision. While online ordering cannot replace the face-to-face human interaction of an in-store experience, it can be a valuable supplemental touchpoint for your guests. Your restaurant’s online ordering experience can be as simple and pleasant as being there in person - and maybe even more valuable. Have you seen a difference between in-store and online orders in terms of average check size? How does online ordering drive revenue for your business?